If you’re a homeowner, you probably do home repairs and projects every once in a while — fix a leaky faucet, paint a room, add on to your kitchen. 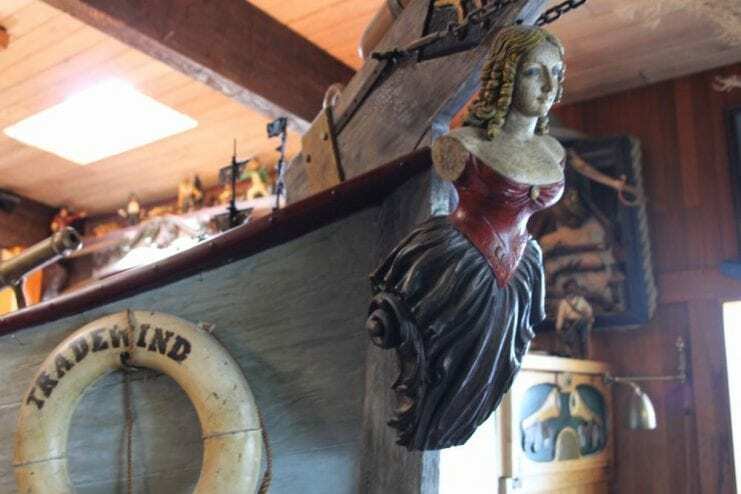 But what if you wanted your home to be more extraordinary, more unusual, more like, say, a pirate ship? One Sitka family has been realizing that vision, slowly turning their home into a shipwrecked, tropical paradise over the last 40 years. There’s a scene in the 1980s classic “The Goonies” when the crew of ragtag kids, who are in search of pirate’s treasure, happen upon the massive pirate ship of the infamous One Eyed Willy. Legend has it that the director didn’t show the young actors the set piece until the moment they filmed the scene. Their jaws drop when they see the stunning structure. That’s how I felt when I walked into Larry and Robyn McCrehin’s home, and found myself standing in a pirate ship that was built, not for Hollywood, but to live in. The McCrehins owned a construction business for many years — they built most of Whale Park in Sitka. But in the winters, when the weather wasn’t good enough to be outside working, they’d pick a project in their home. Like the huge, stone fountain they built in their colorful, tropical bedroom. The fountain is covered in flowers and greenery and a large skeleton wearing a pirate’s hat rests at the waters edge. “We wanted to make it like a shipwreck on a tropical island, and we started down here, and we got a little more class upstairs,” Robyn says, laughing. Upstairs, warm flickering lights cast shadows on high ceilings and smooth wooden walls. The picture windows looking out on Sitka Sound are framed by hand carved “curly cues” as the McCrehins call them, sweeping wooden pieces that resemble woodwork you’d find on a clipper ship. And in the middle of the living room is a striking, massive wooden wheel. But the pièce de résistance— the kitchen — is impeccably crafted, with rich warm douglas fir and cedar cabinets. 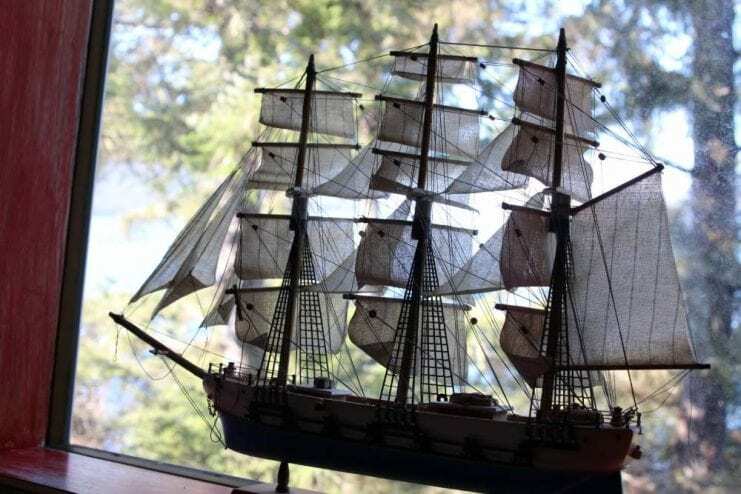 It’s encompassed by the bow of a wooden ship the McCrehins built that juts out into the living room. The booms are long and solid. They’re hand carved too. 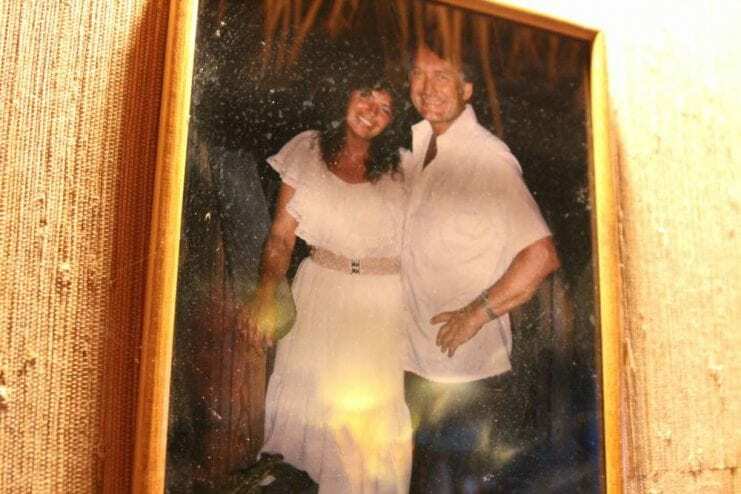 Larry bought the property in 1969 and started building. Slowly but surely, their home underwent a metamorphosis. 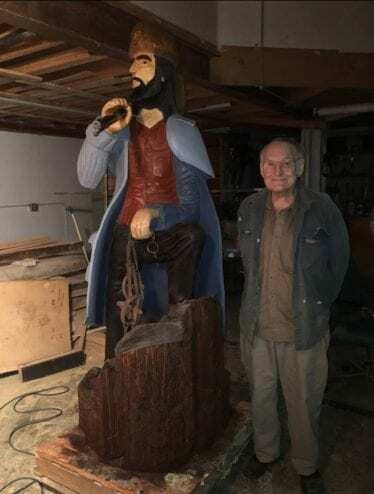 He’s 80 now, and he continues to build and carve pieces for the home. Robyn paints and adds the details. It’s a shared vision, a collaborative effort. And Robyn also finds things that lend themselves to the theme. 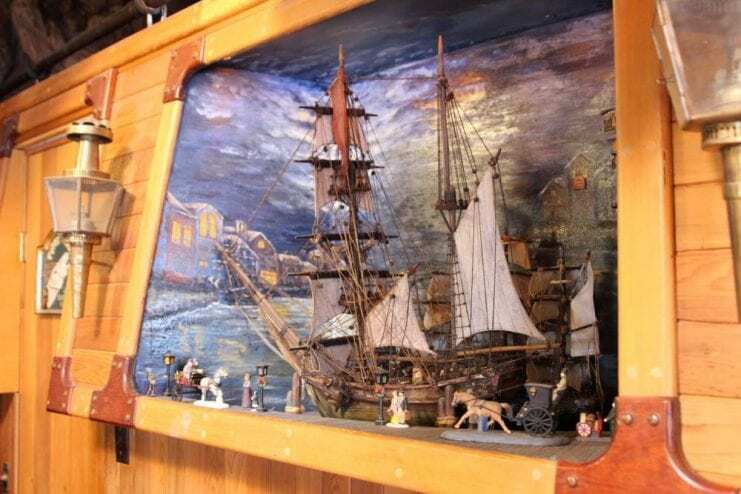 Shelves and nooks built into the walls house intricate dioramas with pirate ships and characters both found by Robyn and carved by Larry. And there’s no find too big: They’ve collected entire boats and found places for them in their home. “This boat here used to be in a garden and we salvaged it before it rotted to pieces,” Larry gestures to a wooden boat near the ceiling, on display in their living room. It’s not the only one they’ve re-purposed as decor. 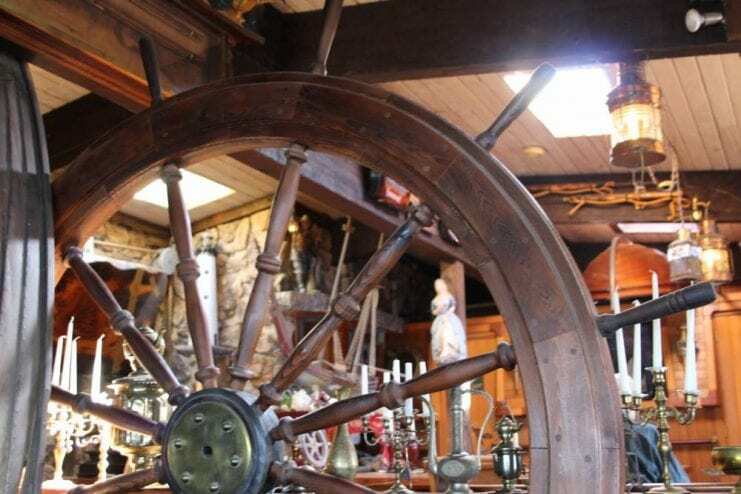 The boat is nestled above a wooden door that actually opens using a ships wheel in place of a handle. That door leads to a room with low ceilings, flickering lights and a small jail cell tucked away in the corner. 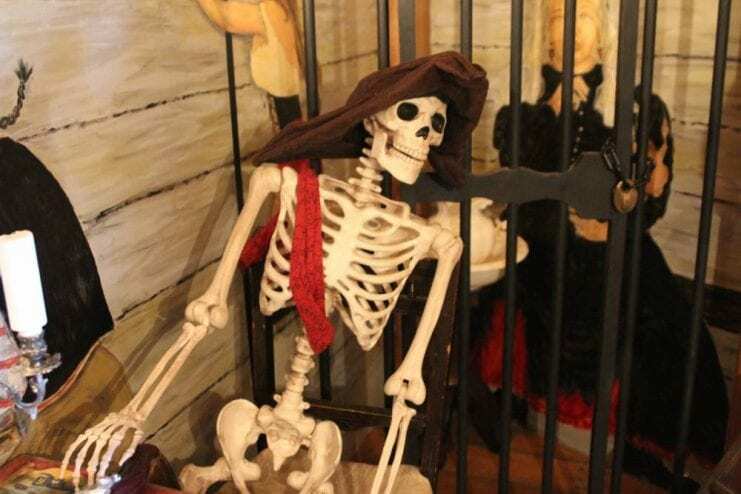 Two skeletons play cards by candlelight. Just past the jailhouse is a hallway full of books. Larry built the bookshelves out of logs they salvaged from the beach, and smoothed and carved details into the shelves. “If you don’t have dried wood that’s cured, your carvings and the stuff, they shrink, they buckle,” Larry says. Throughout the house I notice intricate carvings and detail work that takes a careful hand to create. The hallway ends at a spiral brass staircase which leads up to a widow’s watch looking out on Sitka Sound and an even more extensive collection of books. Next to the staircase is a wooden bucket attached to a system of pulleys. “When I’m done reading the books, I put em in the bucket and I hoist it up. When I go up there and select books that I want to read, I put them in there and lower them down,” Larry laughs. So why a shipwreck? Why pirates? What’s the inspiration here? Peter Pan? Disneyland? Larry says a home has to have a theme. But his daughter Faren McCrehin says it’s more than that. But at the end of the day, it’s pretty simple. “I think they just really love the ocean and they really love pirates and they really love beauty,” Faren says. Faren says growing up in the home her parents created fostered her imagination and helped her realize it’s okay to express yourself, even if you do it boldly. And Larry just wanted home to be a warm welcoming place that inspired his curiosity and awoke his imagination. 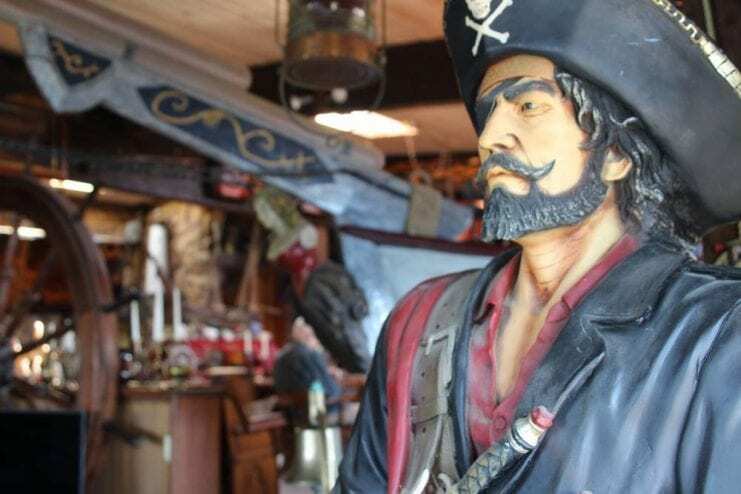 They’re working on the entryway this spring, but perhaps Larry’s greatest secret is in his workshop- a pirate ship he’s been working on for the last 20 years. He hopes to complete the carving this year, and when it’s finished it will live in the McCrehin’s front yard. I got to see the 30 foot wonder, but he wouldn’t let me take any photos. Like he said, he’s not done yet.